Kitten: So, I got two skeins of Sundara sock yarn! Kitten: Are you making fun of me? I don't even care if you are! I'm so thrilled! Sophy: It's so pretty! I failed to get some myself and I've given up. 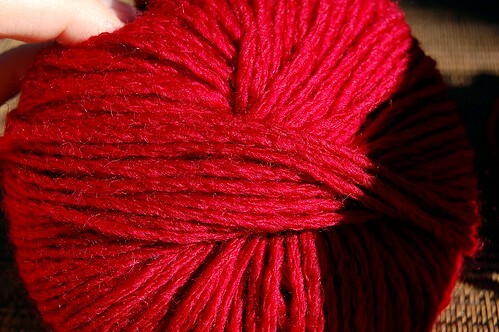 I've promised one of my two skeins to Sophy since I realize how sad it is to want Sundara and not have it. I don't know if I've mentioned it, but I've started a small knit hat for Nathan with this yarn. It has an interesting cabled construction (the yarn, not the hat, which is done in simple two by two rib) but I'm not sure I love it knit as much as I loved it in the little yarn cake. Isn't that always the way? I've only knit an inch or two on it, since a stupid RPG for the PS2 has really taken over my life. In a bad way. Hopefully this next one will be just as much fun. I've got my tiara and pearls at the ready. I will show you pics of that (and my finished napkins, if I ever do finish them). Okay, but here's the real deal, the crafting for this post. It's not sewing, it isn't knitting, it's not even card making. It's COOKING. I know! On the night before Valentine's day, Paul came home with four bars of chocolate and a plan. We were going to make truffles. At first, I groaned to myself because it sounded too ambitious for my Friday night plans, but after a bit, I got very involved with it. The worst part of the whole deal was waiting for the stupid coconut and walnuts to brown for the coating toppings. I've learnt that about myself. One of the things I hate about cooking is doing all the small fiddly parts of it. I don't mind stirring, or measuring, or mixing. I hate waiting. I hate knowing that it takes five minutes to brown coconut and that during that time, we're just standing there waiting for it all to be done. It's why when I used to cook for myself to eat when I lived at my mom's, I used to just put a pot of one box meal on the stove, let it cook through and then forget about it while I went to work on the computer. By the time I got back to it, it would invariably be midnight, the food would be dried and cold, and then I'd eat it anyway. No wonder I never gained much weight -- the food I was eating was nearly inedible. Anyway, so, Paul and I worked together to make some truffles from the America's Test Kitchen recipe and they are DELISH. They are the most fantastic homemade truffles ever. The coating is slightly crisp and shatters slightly when you bite into them. The dusting of cocoa on some of them is so delightful. If you have access to America's Test Kitchen recipes, you need to make some truffles. Hell, sprinkle some sea salt on some. Sprinkle nonpareils on others. Just make them. They are so wonderful. I plan on spiking the next set we make with some Kahlua. If you'll excuse me, I've got to go eat some truffles. I like the sea salt idea! Let's do that next time. And by next time I mean let's make them tomorrow and serve them at the murder mystery for dessert. Two birds. One stone. And one of the courses DONE! That just leaves 3 or 4 others to put together. We need to see pictures of your Sundara! It's SO hard to get...website crashes, gone in a flash! Congratulations! The murder mystery night sounds like a blast!